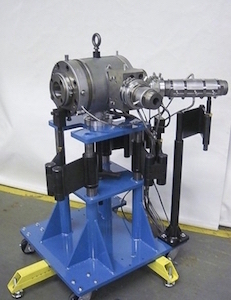 Co-Extrusion Crosshead from Guill Tool Series 725 | Guill Tool & Engineering Co. Inc.
Guill Tool introduces Series 725, a co-extrusion crosshead design for tray cable applications in low-volume, adjustable center work on PVC over PVC. With a yoke gum space adjustment and all stainless steel construction, Series 725 offers machine builders and end users many advantages, including the patented Guill Seal Right system of self-aligning tapered deflector and body design. Series 725 was developed by Guill engineering, in partnership with a customer, to convert a production line from a Tandem line with two heads a distance apart into a co-extrusion line with a single head applying both layers of PVC in a single operation. The efficiency and improved profit potential from such a configuration is substantial, according to Guill sources. 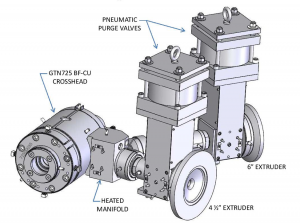 Other end user benefits of this new co-extrusion crosshead include a considerably shorter changeover time (one head is better than two, in this case), less scrap with a single head setup, improved product quality from the increased adhesion between layers, as melt adheres to melt rather than extrudate, plus the inner layer is not exposed to the environment, allowing contaminates between the layers. Additional features of this new crosshead include multi-port spiral flow, easy disassembly and restart, positive seals for leak elimination, adaptable to all extruder brands, max. thru-core of 1.750″ and max. die ID of 2.000″, first layer fixed and second adjustable, the patented Guill Feather Touch concentricity adjustment, vacuum port and the ability to accept two extruders from the same side via the heated manifold assembly. Series 725 is furnished with a tool kit and detailed operator’s instruction manual.